Barbara Zuchowicz D. Mus. (Carleton) M.Mus. 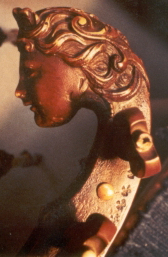 (New England Conservatory) teaches and performs on violas da gamba, baroque and modern 'cello. She believes that music education is important for learners of all ages, and benefits the community in many ways. Her studio currently focuses on adult learners at all levels in Ottawa, ON. As a teacher she supports and encourages adult learning; "Being actively involved in art and music is for everyone." In 1996 for the Ottawa Regional Branch of Ontario Registered Music Teachers she founded the thriving adult student masterclass/recital programme, giving adult music students a unique opportunity to prepare for public performance. She is the Director of the Ottawa Adult Music Camp. She has programmed and performed in innumerable award winning concerts of music from Canada's earliest day in venues from classrooms to the Ottawa Chamber Music Festival, the Boston Early Music Festival, Festival de Musique Sacr�e de l'Outaouais, and the London Early Music Festival among others. Barbara has been heard regularly on CBC Radio and Television and PBS as both a soloist and a chamber music performer. Influential teachers include Wieland Kuijken, Laura Jeppesen, Jordi Savall, Anner Bylsma, and Suzuki Method exponents Catherine Walker, Tanya Lesinsky Carey, and Rick Mooney. She has performed with such outstanding artists as William Christie and Dan Taylor, and as soloist with the National Arts Centre Orchestra, the Hull Chamber Orchestra, Musica Divina, Men's Voyces and Seventeen Voyces, and has recorded for CBC, NPR, the National Film Board of Canada, Trio Amsel, Amsel Baroque, and other ensembles, and has given masterclasses and lectures on a wide variety of early music topics at universities, festivals and workshops throughout North America. The award winning early music ensemble La Favoritte, of which she was a founding member, collaborated with Seventeen Voyces and CBC Television to produce "No�l Baroque", a broadcast of Christmas music from old and New France. This concert, broadcast nationally, included the Canadian premiere of a Pastorale by Marc-Antoine Charpentier, edited by Ms. Zuchowicz. She is a past member of the Royal Conservatory of Music College of Examiners.